Rebecca Kiss/Photography Editor Binghamton University saw roughly 11 inches of snow from Winter Storm Harper, which hit the area over the weekend. 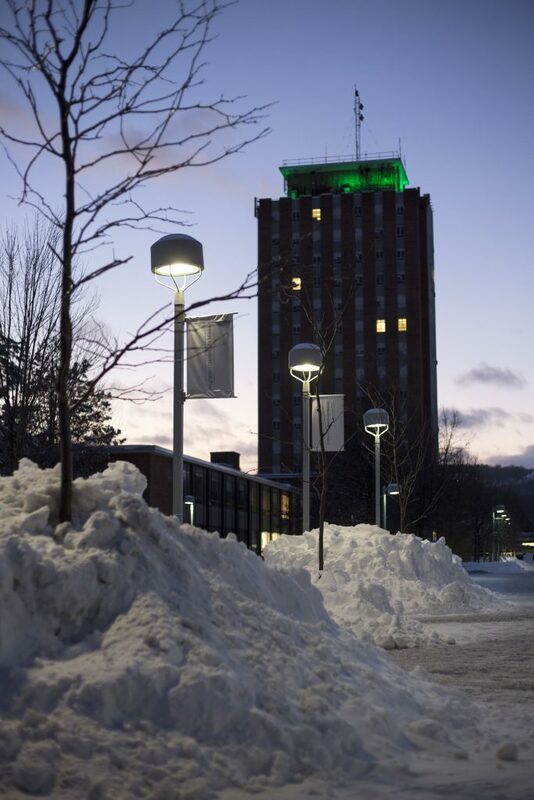 The spring semester got off to a snowy start last weekend with Binghamton accumulating almost a foot of snow, derailing students’ travel plans and leading Binghamton University to open dorms a day early. The University sent out a B-Line statement to the student body on Thursday announcing dorms would open a day early on Jan. 19 at 8 a.m. Students were instructed to notify Residential Life if they planned on coming back early. While the storm was slightly less intense than forecasters initially predicted, it still delayed Escape buses until Monday and resulted in a ban on tractor-trailers and buses on the New York State Thruway and most interstate highways in central New York. The ban, which started at 3 p.m. on Saturday and ended on Sunday afternoon, impacted travel plans for students who rely on buses to return to campus. While students driving personal vehicles had the option of driving back to the University during the storm, many chose to accelerate or postpone their travel plans. Kelly Ma, a senior majoring in fine arts, said she decided to drive to Binghamton on Saturday instead of Sunday. Others, like Abby Kress, a sophomore majoring in biology, traveled on Monday. Kress, who lives on campus, said she decided to come back to school after the storm because she was concerned that her parents might hit snow while driving home. By the time Kress arrived on campus on Monday, she said the roads were fairly clear. Alex Baker, a senior majoring in English, said she waited until Monday to travel back to avoid the snow, but that she would have liked to come back a little earlier to get ready for classes.